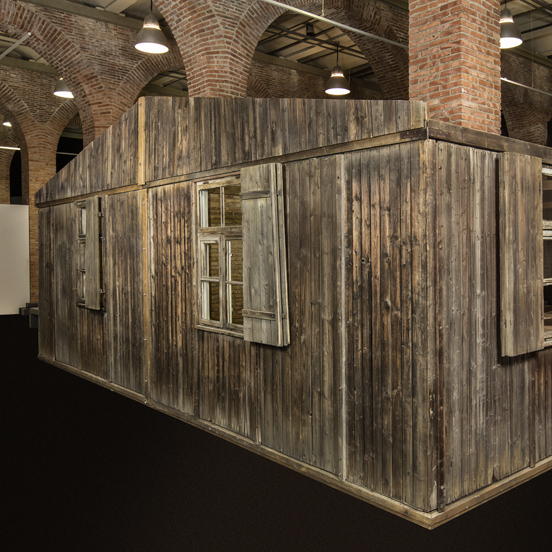 During the stay of the Auschwitz exhibition in Madrid, visitors will be able to see, among other objects, a section of an original barrack from Auschwitz III – Monowitz, which has undergone a long restoration process. This Auschwitz subcamp hosted around 300 wooden barracks, where prisoners selected as able for forced labor were confined during the night. Each barrack was designed to pack as many people into as little space as possible. Even the most minimal comfort was considered too much for the prisoners. The basic structure consisted of 62 bays measuring two by two meters, each with three superimposed sleeping platforms—the bottom one located on bare soil. Originally each platform was supposed to hold three men, providing a total capacity of roughly 550. However, after the modules were designed, Heinrich Himmler decided to increase the camp’s capacity by 33 percent, which was achieved by cramming four instead of three people onto each bay: each barrack would now house 744 prisoners instead of the originally projected 550.